The hands-on software for passionate CW and SSB contesters. It contains the world-unique synthesized voice keyer. No need to record anything into your voice keyer! Tom, KC0W: Super easy to use & understand. Very intuitive. I glanced over the manual after I had already been using the program for 45 minutes or so. Marty, W8AKS: Happy, am I happy, see the footprints on the ceiling! Beautiful job! This has been needed for a long time. ... This puts the fun back into SSB contesting for me. Mike DH6JL/DK6M: It is a wonderful tool when the family sleeps and i'd like to make some talks to friends via air. The free type/talk option is a nice way to talk with people and keep the rooms quiet. * Run Setup_HamRacer1.exe to install the software. You need to run the installer "as Administrator". Can a dumb radioamateur take part in SSB contest? CQ WW DX SSB 2017 - without a microphone! 2019 A new wizard Adjust Audio Levels.. will help you to set correctly all levels for the synthesized voice keyer. CW keying and PTT control through DTR and RTS signals on RS232 (COM port, virtual COM port). Even that the prefered way of interfacing is Spider Keyer, the DTR/RTS approach can still be a good choice for some. A new version of the sketch for Spider Keyer: 1.15 Thanks go to Tom KB9ENS for his professional tests and comments. The New Contest wizard can be now used to modify the properties of the current contest, too. The location of configuration files and sample logs has changed. The change will be mainly appreciated by those who log into the Windows as Users and not as Administrators. It is possible to set low and high cw speed limit for Spider Keyer. It is possible to limit cw speed when sending by hand. It is possible to "preview" cw macros in macros editing dialog. 2019 It is possible to specify points per QSO in the New Contest wizard. It is possible to display graphs for either points per hour, or QSOs per hour. The main window shows now also sum of points, sum of multipliers, count of dupes and total score for HF contests. The main help file enhanced - new chapter Using USB->COM Converter, Options - Spider Keyer. 2019 The main help file updated. 2019 HamRacer can upload the sketch directly to Arduino Nano. Therefore the user doesn't have to install Arduino IDE, etc. All he needs to create Spider Keyer is to attach a new Arduino Nano unit to USB port and select an option from the main menu. 1.2.0.0 Dec 17th, 2018 Unified and simplified approach to all serial devices. There is a user-friendly wizard to connect what you need. HamRacer can make use of Spider Keyer. Spider Keyer is an Arduino Nano based CW keyer that replaces WinKeyer 3. 1.1.8.0 Sep 19th, 2018 Both graphs and the map enhanced. For example, hovering the mouse above the map will pop up a label showing the callsign. 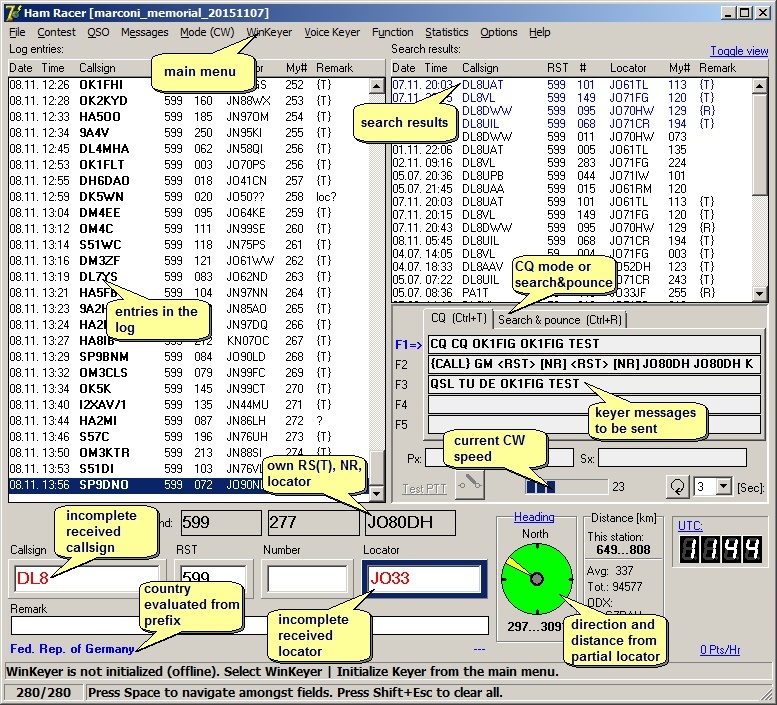 Clicking the label will select the relevant QSO in the log. And, vice versa, selecting a QSO in the log will cause the label showing the callsign to pop up in the map. Synergy new feature: when two HamRacers are interconnected, it is also possible to send a text message from one OP to the other OP. 1.1.7.1 not released Fixed the compass. It showed incorrect colors when JO32 was input for a locator. Used in Alpe Adria VHF contest. 1.1.7.0 Jul 20th, 2018 Implemented import of EDI format. Enhanced and fixed chars (Points per Hour, Average QSO Length). 1.1.6.0 Jun 29th, 2018 It is possible to define multipliers in the new contest wizard. Operator is advised when he is going to make a QSO with a new multiplier. 1.1.5.2 May 21th, 2018 Minor fixes and enhancements. 1.1.5.1 May 9th, 2018 Minor fixes and enhancements. Tested in RuDX contest. 1.1.5.0 Apr 27th, 2018 It is now possible to let HamRacer to manipulate the master volume control in Windows Volume Mixer. Thanks to this you won't have to set the levels each time again. HamRacer can have full control of the output volume level. Help file enhanced (synergy, setting audio levels). 1.1.4.0 Apr 17th, 2018 It is now possible to specify COM port for WinKeyer. It enables to use micro KEYER II. My thanks fly to Hans PA3ACA. 1.1.3.1 Apr 10th, 2018 Possibility to override COM port for WinKeyer (for usage of microKeyer II). 1.1.3.0 Apr 5th, 2018 Better COM port handling (WinKeyer) on older PC. It is now possible to run more instances of HamRacer simultaneously. Multiple selection is now possible of log entries. Copy and paste implemented. Logic of the registration window improved. It is possible to interconnect two instances of HamRacer over LAN or Internet. While connected all the changes in log are synchronized with the other HamRacer. 1.1.2.0 Feb 27th, 2018 Pre-filling of CQ and ITU zones. Speed optimization for extremely slow (old) computers. Tested in CQ WW 160M SSB. 1.1.1.0 Feb 1st, 2018 Distinguishing a USB->COM converter by its HW signature. Fix in licensing. 1.1.0.1 Jan 25th, 2018 Minor fixes and enhacements. New Search function. Used in CQ WW 160m CW. 1.1.0.0 Jan 12th, 2018 Implemented the possibility to control PTT through DTR/RTS signals on a (virtual) COM port. 1.0.0.4 Jan 2nd, 2018 Minor fixes and enhancements. 1.0.0.3 Jan 1st, 2018 Fixed "stack overflow" problem when connected WinKeyer. Tested in Stew Perry contest. 1.0.0.1 Dec 22th, 2017 First version released to beta testers.